During our extended adventure, we have made our plans and schedules in stages. We wanted to have some flexibility and we didn’t really know where we would want to go. Planning in stages gave us the ability to respond to new information or follow a sudden whim. Our planning sessions could only take place when we had access to wifi or enough cell service to create a hot spot. They also usually happened during inclement weather when we couldn’t really be out hiking or sightseeing. Jim and I would sit at the table in our lounge with atlas at hand and plot out the next stages. The one inflexible aspect to our trip was my need to fly back to Massachusetts for the spring meeting of the Friends of Smith College Libraries. We knew that where ever we were, I needed to head east in early April. In mid-March we had a planning session and identified San Antonio as the best place for me to fly out of and for Jim and Dakota to hang out in until I could get back. We worked our plans around this. After our happy idyll in Lost Maples, we headed to San Antonio and the Blazing Star RV Resort. Blazing Star was quite nice. It was located on the west side of San Antonio in an area which was being built up at a dizzying pace. The traffic in the area was relentless. Driving in or out of the rv resort was enough to make me want to scream. The resort itself was an oasis. We arrived at Blazing Star on a Tuesday afternoon. We unhitched and got settled in. Little did we know our stay would extend to a full week. Bright and early the next morning Jim and Dakota drove me to the airport. My plan was to fly in to Bradley/Hartford airport. Bradley lies equidistant between our house in CT and Northampton. I would land, rent a car and drive to our house in CT for the night. By a happy coincidence Peter had a work dinner in Wilton and would join me for a brief overnight visit before I headed to Northampton that next morning. We had a really nice visit. As always he required feeding and we had breakfast at Christy’s in Torrington. It was so great to see him after three months’ absence. Going back to Smith and Northampton is always a homecoming. Being there just makes me feel happy and peaceful. I have been on the Friends of Smith College Libraries’ Executive Committee for at least seven years now. The board is a great group of very smart and interesting women and it is always delightful to be with them. It is fun to see the students on campus and to stay in touch with this amazing place. This visit was especially exciting. Saying I feel at home in Northampton has extra meaning these days as Jim and I are having a house built in nearby Florence. This is another long-held dream of ours. We love this community tucked in the hills with five colleges nearby to give it a cultural life and a thriving downtown full of restaurants and shops. We had discovered the development in which we were building our house two years earlier just before Ellie graduated from Smith. After a somewhat attenuated courtship, we settled on our lot #20 at Bear Hill. On Thursday after a lunch with Susan Fliss, the Dean of Libraries, and Mary Irwin, Gifts Officer, and my co-conspirator for FSCL, I headed over to see our house in progress. It is starting to really look like a house! Shauneen Kocot, our realtor, met me and we toured the construction site together. After our library meeting ended on Friday, three of us headed to the airport and that is when the fun began. Of course, “fun” is not really the proper term. To say Delta seemed either drastically incompetent, uncaring or both, would be an understatement. I won’t go into detail, but just say the next two days involved hours of standing line, holding on the telephone and teeth gnashing. Wait times on the phone exceeded three hours and their call back system didn’t work. I was fortunate in that I could re-rent a car and go back to our house in CT unlike so many who were stranded in airports. At least I had a familiar pillow and comfortable environment. After two days of trying to re-book a flight on Delta, I gave up. It didn’t seem like they even remembered my existence. I booked a flight on American. I hope never to fly Delta again. What I also hoped is that American would carry me back to San Antonio and Jim, Dakota and the Airstream and we could get back on the road. This experience did give me one interesting perspective. Home. What is home? I was at home. I was at our house in Connecticut which has been my home for 34 years and yet, I kept saying I needed to get home. 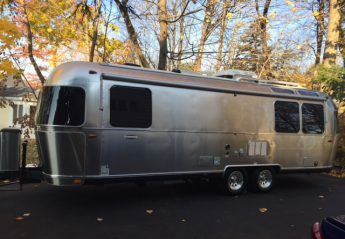 I was almost frantic to get “home.” Home in that context was home to Jim, Dakota and the Airstream. So, I guess home can be a place, but perhaps more significant is that home is a state of mind or of heart. My heart was in San Antonio.